Cereal, pancakes, waffles, breakfast bars, smoothies, REPEAT. STOP the breakfast rut NOW!!! Breakfast can get pretty boring at our house. Cereal, pancakes, waffles, breakfast bars, smoothies, REPEAT. We are always rushed in the morning, and sometimes I don’t have much time to be creative. These have just a handful of ingredients, quick and very tasty! The options are endless with the stuffing ideas. You could always vary the cheese, add some veggies or different meats. The whole family loved this one! A definite 10 on the yummy meter 🙂 Hope you enjoy! 1. Preheat oven to 375 degrees. Beat 2 eggs and season with a pinch of salt and pepper. 2. 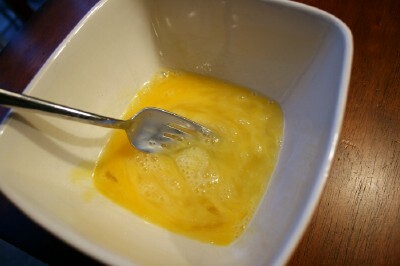 Scramble your eggs with the 1/2 tbsp of butter. Set aside in a bowl. 3. 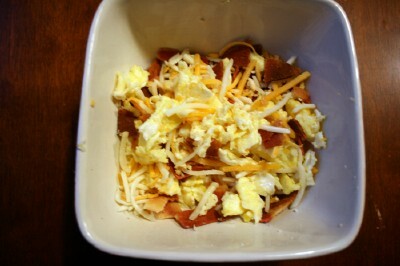 Cook your 3 slices of bacon (we just have to microwave our veggie bacon) and crumble into the bowl with the eggs. Add 1/4 cup of cheese and mix together. 4. 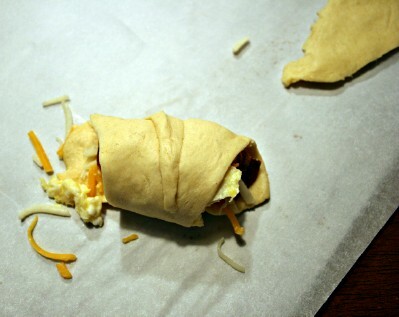 Unroll your tube of crescent rolls and separate into triangles. Spoon egg mixture onto triangle. 5. Roll up. Place on a baking sheet and bake for 11-13 minutes or until golden brown. These did reheat well in the next morning. So feel free to make a batch Sunday night to reheat the next week! 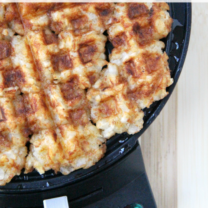 Hope you enjoy these Savory Breakfast Bites as much as my family does! Preheat oven to 375 degrees. Beat 2 eggs and season with a pinch of salt and pepper. 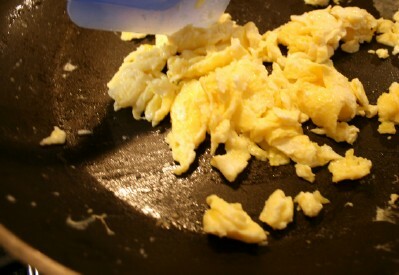 Scramble your eggs with the ½ tbsp of butter. Set aside in a bowl. Cook your 3 slices of bacon (we just have to microwave our veggie bacon) and crumble into the bowl with the eggs. Add ¼ cup of cheese and mix together. Unroll your tube of crescent rolls and separate into triangles. 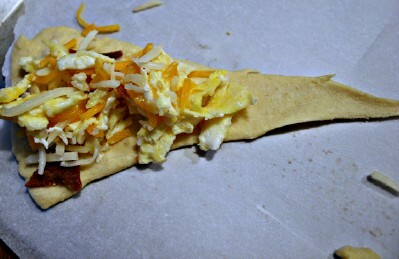 Spoon egg mixture onto triangle. Roll up. Place on a baking sheet and bake for 11-13 minutes or until golden brown. so i finally made these for dinner last night. they were great! 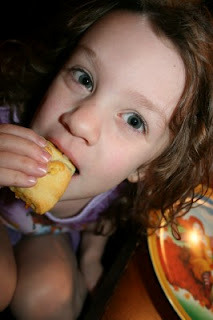 the kids were a tad leery of them (eek, new food!) 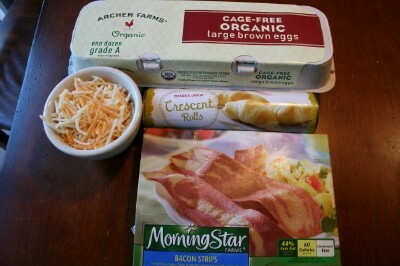 but once i told them it had everything they liked in it (eggs, cheese & BACON) they tried it. next time: no cheese for olivia. 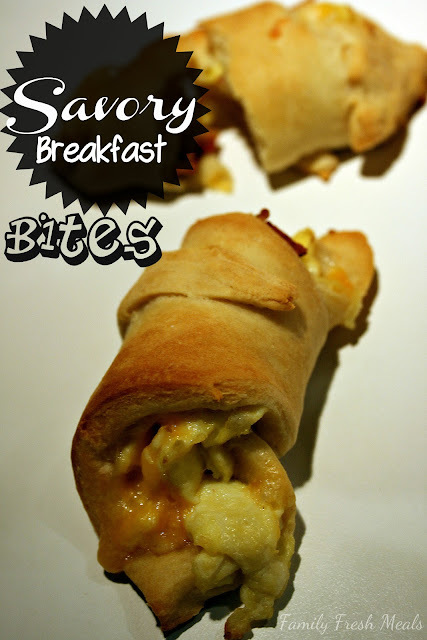 i also REALLY want to make these with garlic crescents next time! great recipe, chef corey! They are in the oven right now!!! 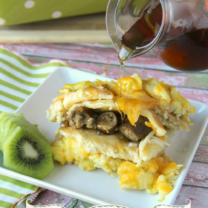 Can not wait:) Super easy, I substituted turkey sausage for the bacon though. Boys are excited to try them! 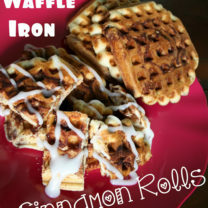 Made them for Thanksgiving breakfast and ate four of them myself–yikes! They were awesome! I just made these. What’s the best way to store and reheat these?